Our lab does "biomodeling", because it is interested in the creation of 1) experimental models using additive manufacturing technologies for the creation of tissue scaffolds and tissue engineered constructs with microstructural cues, and 2) predictive computational models of 3D tissue and cell-level mechanical effects of bioprinting cells and the effect of shear-mediated perfusion flow at a single cell. On the "biomeasurements" side, our lab is interested primarily in optical image acquisition and processing for quantitative measurement of cell morphology and tissue microarchitectures. 1) Novel Melt Electrospinning Writing System towards the development of 3D scaffolds with cellular relevant geometrical features. Controlling cell behavior (e.g. stem cell differentiation) has generated immense attention in the fields of tissue engineering and regenerative medicine. Emphasis has been given to the creation of 3D biomimetic environments that replicate the complex nature of the extracellular matrix (ECM). This trend has been driven by the well-known sensitivity of cells to extrinsic signals including surface topography, substrate mechanics, and biochemical cues. A key factor that has not been systematically studied and decoupled from other variables is the substrate dimensionality or scale aspect of in vitro culture models. Thus, the main objective of this project is the process design of scaffolds with controllable structural characteristics, where the scaffold dimensionality via fiber strut diameter and pore size is selectively tuned. 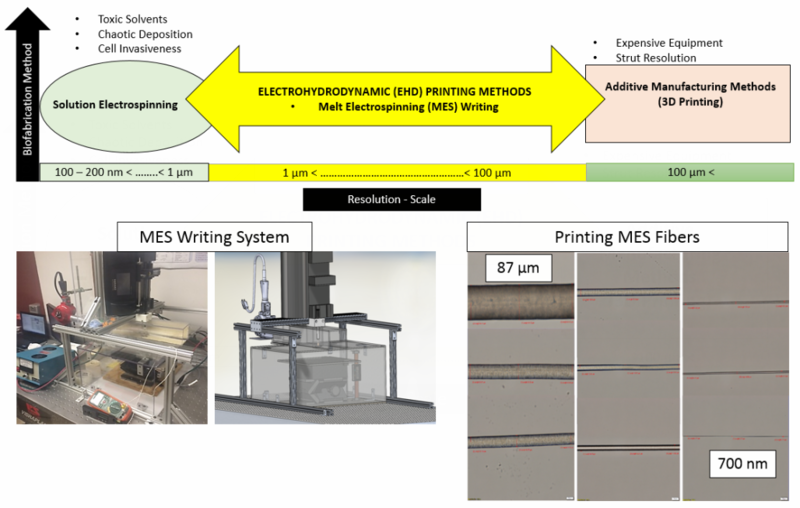 To this end, a melt-electrospinning setup has been designed that aims to fabricate such reproducible scaffolds, where a predictive mathematical model has guided the design based on detailed rheological studies of the polymer material. Estimating the reliability of mechanical structures plays a critical role in the performance assessment of a global system. Recent advances in additive manufacturing (AM) enable unprecedented part complexity and flexibility requiring more design variables that carry a greater amount of fabrication uncertainty in tow. This uncertainty is magnified in the context of multiple points along the digital thread in AM where part design is connected with machine instruction. While complex AM parts can now be fabricated, this added complexity typically requires a highly nonlinear or discontinuous limit state function (LSF) for their reliability estimation, motivating our lab’s ongoing work to formulate an efficient, generalized model to quantify AM printed product performance. To accomplish this research objective, we propose to implement a Deep Neural Network (DNN) based model to approximate the complex AM printed structural response function. DNN as a deep-learning method is a representation-learning method with multiple levels of representation, obtained by composing simple, albeit non-linear modules that each transform the representation at an elementary level (starting with the raw input) into a representation at a higher, slightly more abstract level. Composed with a sufficient number of such transformations, very complex functions can be learned. In contrast to deploying prohibitively high computational resources and time for structural analysis using Monte Carlo Simulations (MCS), particularly when the AM printed parts exhibit non-linear or discontinuous numerical model behavior, DNN will enable: 1) the estimation of structural performance with only a limited number of training samples and 2) an essential representation of the input variables based on the inherent deep hierarchical structure. 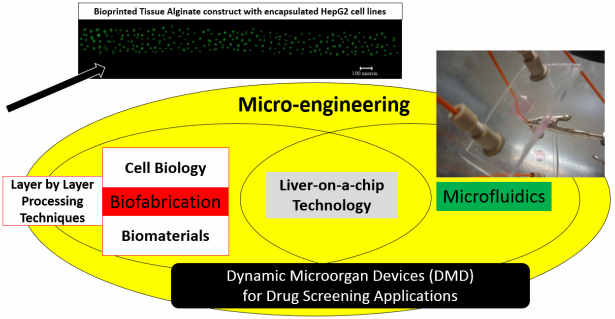 3) Numerical & Experimental Investigation of Dynamic Micro-organ Devices used as Drug Screening Platforms. Physiological tissue-on-a-chip technology is enabled by adapting microfluidics to create a micro scale drug screening platforms that replicate the complex drug transport and reaction processes in the human liver. The ability to incorporate three-dimensional (3d) tissue models using layered fabrication approaches into devices that can be perfused with drugs offer an optimal analog of the in vivo scenario. The dynamic nature of such in vitro metabolism models demands reliable numerical tools to determine the optimum process, material, and geometric parameters for the most effective metabolic conversion of the perfused drug into the liver microenvironment. Thus, in this project, we focus on modeling of in vitro 3d dynamic microorgan devices (DMD), where the human liver analog is replicated by 3d cell encapsulated alginate based tissue-engineered constructs. These constructs are hosted in the chamber of the DMD device serving as walls of the microfluidic array of channels through which a fluorescent drug substrate is perfused into the microfluidic printed channel walls at a specified volumetric flow rate assuring Stokes flow conditions (Re<<1). Due to the porous nature of the hydrogel walls, a metabolized drug product is collected at the outlet port. A rigorous modeling approached aimed to capture both the macro- and micro-scale transport phenomena has been implemented. Initially, the Stokes Flow Equations (free flow regime) are solved in combination with the Brinkman Equations (porous flow regime) for the laminar velocity profile and wall shear stresses in the whole shear mediated flow regime. These equations are coupled with the Convection-Diffusion Equation to yield the drug concentration profile by incorporating appropriate reaction terms described by the Michael-Menten Kinetics model. This effectively yields a convection-diffusion–cell kinetics model (steady state and transient), where for the prescribed process and material parameters, the drug concentration profile throughout the flow channels, can be predicted. A key consideration that is addressed in our proposed modeling approach is the effect of mechanotransduction, where shear stresses on the encapsulated cells alter the functional ability of the liver cell enzymes to metabolize the drug. The 3D model represents a single channel parallel model geometry of the large scale bioprinted DMD shown in the video above. 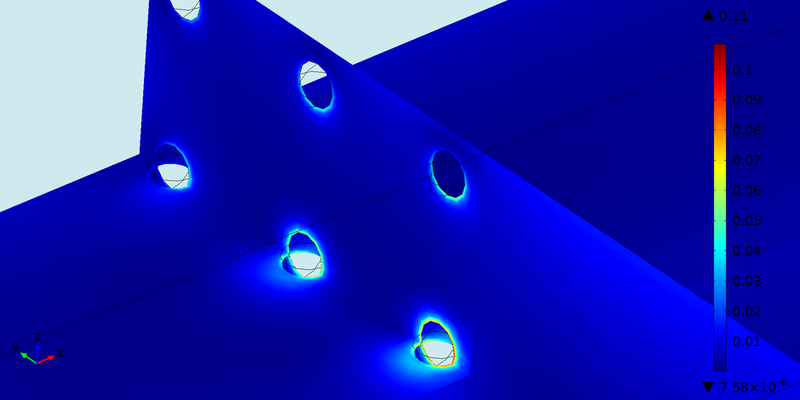 Simulations were performed using Comsol Multiphysics 4.4 (Burligton, MA). Cells are explicitly incorporated in the model as spheres (10 μm diameter) and WSS is simulated around the cell membrane altering the metabolic activity of the encapsulated hepatocytes. 3) Optimization of micro-extrusion bioprinting system. Bio-additive manufacturing methods enable the layered fabrication of temporary 3D scaffold structures, where cell morphology and function are driven by a variety of microstructural cues prescribed by the scaffold design. Specifically, bioprinting systems with robotic dispensing arms have implemented cell-laden hydrogels as “bio-ink”. However, its watery nature limits its printability, yielding cell-laden hydrogel scaffolds with non-uniform, large fiber diameters and pore dimensions (>100 μm) [1,2,3]. Therefore, the objective of this study is to develop a new methodology to improve the existing bioprinting process with respect to manufacturability and feature size resolution, with quantitation of any process-induced cell damage introduced during the process path . Specifically, in the present study, we report the manufacturing and biological consequence of cell-embedded hydrogel fiber stretching using a bioprinting system (fab@home) with fibroblast cells encapsulated in alginate hydrogel. To accomplish our objective, the printability of alginate is initially assessed with respect to its physiochemical properties, namely the material rheology and the cross-linking mechanism. Hyperspectral Image Processing using Photometric Stereo Algorithms for 3d reconstruction of burn skin depth..
Quantitative reconstruction of a 3D depth map for real-time skin burn assessment and bioprinting toolpath generation. Additive manufacturing processes using layered co-deposition of biopolymers with cells and bioactive molecules, has enabled the creation of 3D complex biological structures that recapitulate organ-level function. The printing of cell-laden biopolymer structures that offer a 3D microenvironment enabling cells to express in vivo functionality, is a promising approach to address the challenge of limited donor grafts for functional organs and repairs. Current skin grafting procedures for skin burn treatment demand the removal of skin from a donor site towards the creation of split-level or full thickness grafts guided by the classification of burn depth. Thus, large area, deep burn wounds cannot be treated successfully due to the prohibitive demand of harvesting significant amounts of functional skin tissue from the donor site. In addition, the preparation time of the skin graft increases with the complexity of the wound shape and depth, leading to irreversible burned injuries. To this end, the authors propose a novel method whereby a commercial additive manufacturing system (fab@HOME) prints a specific skin graft, whose 3D model is obtained by a custom image processing algorithm applied on images of the burned area.